Do you know where the Golf Power Point is? If you want more distance and power from your golf swing understanding this simple concept is absolutely crucial. This concept is explained in many different ways and thanks to countless bad explanations it all to often confuses golfers, actually hurting their golf swing. That’s why I got world renowned golf instructor Darrell Klassen on camera to clear the air on this topic. The explanation given above by Darrell Klassen is one of the simplest and most straight forward golf lessons I’ve ever heard so listen up! The main point of this lesson is that while many instructors and TV golf personalities have the right idea in mind they are simply explaining it wrong. For maximum distance and power you DO want to explode maximum power into the golf ball at impact. However, in order to accomplish this you must actually focus your energy on a point beyond the golf ball – a simple tweak that makes all the difference. Why? The answer is simple. If you focus on achieving maximum club head speed right before you reach the ball you will naturally stop accelerating through impact (your brain says “I just hit the ball, we slow down now”). The problem is for maximum power and distance you must still be accelerating at impact. The easiest and most effective way to ensure that you accelerate through the ball for maximum energy transfer is to focus on a point about a foot beyond the golf ball. What is the result? Nothing major just longer more consistent drives. This simple trick is 100% mental. You are still swinging on the same path, doing essentially the same thing. You are only changing your mental focus so that you accelerate for a split second longer, a split second that will be a huge boost for you golf swing. For more of Darrell’s simplified golf instruction Click Here. 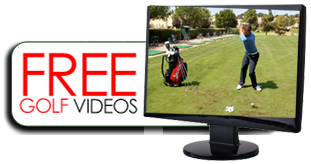 Hey it’s Doc O’Leary here with another free golf video for you. Improving your golf short game is all about consistency. Once you develop a consistent chip shot you can start predicting the trajectory and distance of these shot and start getting closer to the pin. To develop this kind of consistency in your chip shots you have to eliminate bad habits. One of the most pervasive bad habits is using the wrists during these short chip shots. Using the wrists introduces all sorts of problems. Yes, you may hit an amazing shot every once in a while if you use your wrists while chipping, but overall you will not be consistent and you’ll have a hard time shaving strokes off your golf scores. This golf drill in this video is all about learning to chip with your pivot, not with your arms or wrists. To teach this Bobby Schaeffer likes to use the concept of the “flying wedges.” To avoid confusion I’m going to go more into depth about what those wedges are. He explains it more fully in another part of this instructional DVD. Basically if you put your arms and hands in the proper impact position (as shown at the beginning of the clip) the club shaft will make two very important angles (flying wedges) with your arms. The first flying wedge is most obvious. There should be a fixed angle (wedge) between the handle of the golf club and your right forearm. This wedge is nice and wide. It’s stable and by maintaining this wedge you’ll also have to keep your right elbow bend and in toward your body. The second flying wedge is less obvious. There will be a smaller fixed angle between the very end of the golf club handle and the underside of your left forearm. This angle (wedge) only exists when you are choked down on the golf club a bit. By focusing on keeping these flying wedges fixed throughout your golf chip shots you’ll be forced to use your torso and core pivot to move the golf club. This is exactly what you want. The drill using two golf clubs, one under your arm pit, takes this concept to the next level. It prevents you from using your wrists even if you want to. By taking your wrists out of the equation your golf chip shots will start improving dramatically, and so will your ability to score around the greens. This clip came to you from Bobby Schaeffer’s Beyond Long DVD package. For access to the whole program click here. Golf Tip – Can A Metronome Help You Sink Putts? Having a consistent repeatable stroke is a big part of sinking putts. This golf tip will definitely help you sink more 8 to 10 footers. More importantly this putting drill will help you sink those 4 to 6 foot putts where your nerves and the pressure of losing a round are weighing on you. It’s all about having a consistent rhythm ingrained in your head so that no matter what kind of putt you are facing you know exactly what to do. The metronome is a great tool for developing rhythm and tempo, after all that’s why musicians have been using them for nearly two centuries. So how do you use a metronome to improve your putting? It’s very simple. First of all you’re only using the metronome for that very last part of your whole putting routine. It wouldn’t make sense to hold yourself to a strict rhythm while reading and aligning your putts. Instead you’ll only be using the metronome for about the last 4 seconds of your putting routine, the part where you take your last look at the hole then make your putt. To do this you have to break those last few seconds down into specific movements. As Bobby Schaeffer points out in the video those movements are 1) Your last look at the hole 2) Moving your eyes back to the ball 3) Taking the putter back and 4) Impact with the ball. When you learn to do these four steps in a set rhythm you’ll be able relax even during tough putts. Having a set routine means you won’t really have to think about much during the stroke, you already know the exact movements you are going to make and how long they will take. The actual speed you set the metronome to doesn’t matter all that much. What matters it that you learn to use that same rhythm every time you make a putt. You can certainly use this drill without a metronome but having a metronome will help keep you honest. Also listening to the continuous beats will help you internalize whatever putting rhythm you choose. For more tips on becoming a master of putting check out Bobby Schaeffer’s Hot Touch Putting. How Can A Marshmallow Improve You Golf Swing? Strange tip I know…but I’ve seen this trick help many golfers. 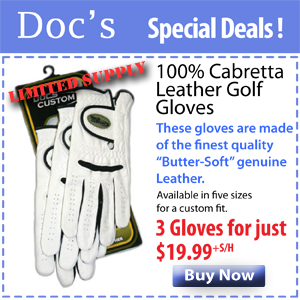 Like Darrell says in the video it is difficult for many golfers to take their mind off the golf ball when practicing. You may be wondering “why would I want to take my mind off hitting the golf ball, isn’t that the whole point of golf.” Think of it this way, is it possible to make a good golf swing without hitting a ball? I think so. For many golfers the second you put a ball in front of them their natural swing disappears and they start to hit AT the ball, not THROUGH it. When you aren’t hitting through the ball you are slowing down at impact. Slowing down at impact can cause a whole bunch of nasty things to happen to your golf swing, not to mention it robs power and distance from your golf shots. The marshmallow trick allows you to focus on your swing NOT what you are hitting. Once you focus on your golf swing it is much easier to accelerate through the point of impact. Like Darrell explained in the video the best way to practice with this trick is to swing and imagine hitting an object that is a foot or so past the ball/marshmallow. The ball or marshmallow will naturally get in the way. When the ball is just getting in the way as you accelerate toward the imaginary object you will know that you are hitting through the ball. This will maximize your distance and and eliminate all the problems that come from decelerating before impact. For more golf instruction from Darrell Klassen check out his signature series package. It’s a great deal you don’t want to miss out on. Falling Victim To The Putting Illusion? As Bobby said in the video the importance of proper putting cannot be ignored if you want to shoot low scores. I’ll admit putting isn’t the most fun thing to talk about, but let’s face it consistently dropping 6 footers will take a serious bite out of your score (plus it will drive your golf buddies nuts). Golf is a mental game and putting relies even more heavily on your mental state and confidence level. That’s why overcoming the illusion Bobby talked about is so important if you want to become a consistent putter. Focusing on keeping the putter face perpendicular to the target line through your whole stroke will drive you nuts, force you to do some funny things, and cause you to lose confidence on the green. To eliminate many of those problems all you need to do is understand that the putter face will open and close naturally through your putter stroke. Some guys intuitively understand this or simply go with what work, and through chance and luck they figure it out. Others guys (like me) need to understand this phenomenon conceptually before our brains will let us trust the putter stroke. This video and the inclined plane tool should prove to you that taking the putter straight back on the inclined plane results in the putter face opening up. The same rules of geometry that caused it to open up will cause it to be square when it hits the ball. So as long as you take the putter straight back you don’t need to worry about getting or keeping the putter face square at impact. All it really comes down to is accepting that this is fact of golf. It will allow you to focus on much more important things while putting, such as your speed, follow-through, break, and the speed of the greens that day. You probably don’t have an inclined plane at home so use a score card like Bobby showed in the video if you need to prove it to yourself. The score card will also help you ensure that you are bringing the putter straight back. For more putting tips and tricks from Bobby Schaeffer check out his Hot Touch DVD Package. This stuff will shave some serous strokes off your score. Who doesn’t want more club head speed? This is one of the simplest ways you can boost your club head speed and start hitting longer drives. This warm-up swing forces your golf swing to have a longer, wider arc. The longer the arc of your golf swing the more time you have to speed up the club head, which is exactly what you want to do. Widening the arc of your swing also helps prevent you from swinging from the outside-in (which is what causes a slice). Starting a warm-up swing with the club head held out in front of you makes it practically impossible to swing outside-in. So if you slice the golf ball this is an especially good warm up. This practice golf swing has one more advantage. Many players strike the ground on their warm up swing, whether they are getting ready for a drive or a 100 yard pitch shot. This subconsciously trains your mind to strike the ground first not the ball (this is almost always a problem, unless you are hitting out of a bunker). If you are doing this you are literally training yourself to hit fat shots. You want to train your brain to hit the ball first, so starting your practice swing up off the ground takes your focus off the ground and puts it on your swing and the golf ball (the two most important things in golf). On the downswing of your practice swing just skim the grass, there is no purpose to hitting the ground (your golf scores and the greenskeeper will be thanking you). If you want to start hitting longer more consistent drives try using the practice swing in the video above. For more great golf tips like this check out Marc Minier’s “Squaring It Up”. The key to hitting longer drives is developing a more powerful golf swing. As many of you know swing power is not developed in the arms. Instead the power in the golf swing comes from your core and your pivot. One of the crucial ways you get power out of your core is by creating torque from your torso. It’s kind of like winding up a spring (your spine is the spring). The trouble is many golfers think they are winding up their torso, when in reality they are just turning their whole body during the back swing. To visualize this, think of a bungee cord going from your right shoulder to your left knee. If you turn your shoulders the same amount as you turn your hips there won’t be much tension in that imaginary bungee cord. In other words there isn’t much torque in that swing. If however you rotate your shoulders more than your hips you would be stretching that cord and storing a lot of torque and power in your golf swing. Now don’t get me wrong your hips and knees will rotate to the right during the backswing. The key is that for a powerful swing your shoulders must rotate further. The key to this simple golf bucket drill it that is makes you conscious of how you are winding up your torso and hips. You can see and feel it right away. If the bucket is pointed in the same direction as your shoulders you know you haven’t created any torque in your golf swing. That’s what makes this golf drill so powerful. You don’t need anybody to watch your swing, and there is no guess work (even better it’s free). So go out there and try this out. For more great tips like this from PGA Golf Pro Marc Minier (He’s also received the Teacher of the Year Award 4 times) Click Here. Chipping is a crucial part of golf. You can’t hit every green in regulation (even the pro’s don’t), so being able to chip it close enough to one putt is the secret to making or saving par, while your buddies are struggling for bogie or worse. As you saw in the video getting the golf ball high is crucial when you need to get over a bunker, or any other obstacle around the green. To get the ball high into the air with a chip shot you have to do a couple things to your golf swing. First you need to put your weight slightly back onto your right leg. Next you need to take the club back low and swing at a low angle. Taking the club back low sets you up for a flatter swing arc in the downswing. This enables you to hit lower on the golf ball than normal. Think about it like you are taking the club and slicing in between the ground and the ball. You want to keep the club low on your follow through too. This doesn’t mean you slow down at impact or stop your swing after contact, you have to hit through the ball just like any other golf shot (except certain bunker shots). You have to keep your momentum through impact. Simply keep the club low on the follow through. This will keep you from trying to scoop the ball. Scooping the golf ball doesn’t get it in the air. Don’t be afraid to bring your lower body into this shot. You still want a weight transfer just take it nice and easy. Also try hitting these shots off of a variety of grass conditions. They are really easy to hit off of a fluffy lie, but you can still hit them off of short grass (it just takes some practice and confidence). These shots are actually a lot of fun to practice, try popping the ball up and over shrubs and small trees. The more you practice the better feel you will get with these high chip shots. For more short game instruction from Darrell Klassen Click Here. Now go out there and give these shots a try.